Rita Ora's decision to sue Jay Z's Roc Nation record label was reportedly sparked by her feud with Rihanna,The Sun reports. It's alleged Rihanna, who signed to Def Jam in 2005 when Jay Z was President before later moving to Roc Nation, played a part in Rita not getting treated as a priority at the company. Rita also reportedly found out Rihanna had been offered all the hit tracks before she was, even though she's still yet to make a follow-up to her 2012 debut. This was said to be the final straw for the star who is now suing the rapper's Roc Nation label, which also has the likes of her ex Calvin Harris on their roster. 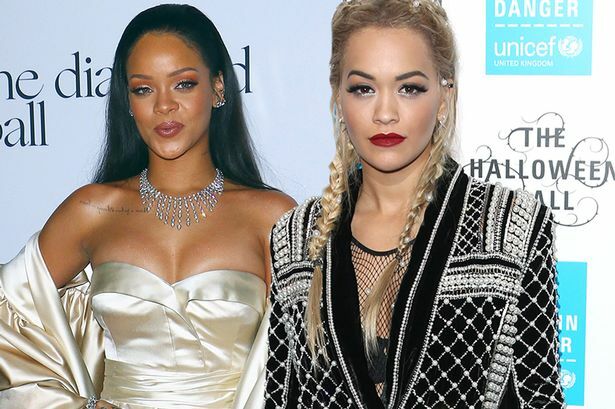 “Rihanna has never liked Rita and has been using her power at Roc Nation accordingly. This is the main reason the label’s execs have been uninterested in putting effort into promoting Rita," a source told The Sun. “Songs that might be submitted to her are automatically given to Rihanna, who may then hold them for months before deciding she doesn’t want them. The fact that Rita’s ex Calvin Harris is on their management books hasn’t helped either. The source also said the label didn't stop the millionaire DJ when he reportedly banned her from using songs he had produced for her album following their break up.